Improv is hard. I can prove it. In order to get onstage and be part of any reputable improv troupe, you need years of training. You need three or four or five or six or seven levels of painstaking instruction. You need to read books, attend workshops and seminars. You need to familiarize yourself with loads of formats and games. You need constant feedback from as many gurus as you can stomach. I’ve seen students who go through five levels of expensive, intensive training who spend the next few years questioning whether they can actually do this stuff. They begin their journey by dipping their toes in the water at the shallowest end of the pool. They see more experienced students cavorting in the deep end. And they develop a fear of drowning that sometimes never goes away. They carry (sometimes literally, sometimes figuratively, sometimes both) a list of a hundred do’s and don’ts. They constantly check themselves against that list, like amateur golfers trying to get all the aspects of their swing lined up. Head down. Feet apart. Right arm straight. Turn from the torso. Let’s think about this. Improv is often about mirroring reality onstage in a somewhat method-driven way. It’s about remembering what it was like to wonder and freely express — like a child. It’s about taming that and channeling it — like an adult. So, you’ve spent years learning how to be a child and how to be an adult. Really? Improv is easy. I can prove it. I taught a six-week Tao of Improv course (the seventh week was a performance). The class included some intermediate improvisers and mostly brand new students — some of whom had never even seen improv. I threw them in the proverbial deep end from Day One. They were performing Slackers, Armandos, branching duo scenes, monoscenes and more. Day One. Did they do it well? No way. They were given simple steps to make their lives easier. They followed the steps. Their performances improved. 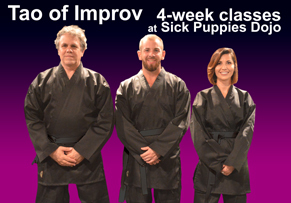 They sensed the improvement and were encouraged (not discouraged, which seems to be the goal of many improv courses). By week four, they were doing these difficult formats quite well. By week five, they were killing it. By week six, they were performance-ready. And they nailed it in their performance in the seventh week. There is no deep end. There is no “beginner’s gym.” There’s only a gym. You use the same machines, whether you’re a newbie or an old hand. You just add more weight, do more reps and work on your form. You don’t need to dip your toe into improv. You can dive in. It’s improv. You won’t drown.